Invest Openly: Are You Happier In Saving Extra $X OR Earning Extra $X? 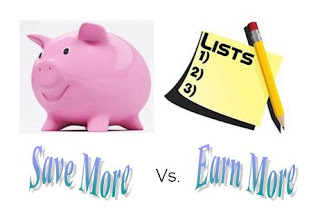 Are You Happier In Saving Extra $X OR Earning Extra $X? There is a saying (from personal finance perspective) : "How much you earned is not the key, the key is how much you've saved"! Of course, again, there is no right or wrong answer to this but more of a personal viewpoint. "Are you happier in savings extra $X OR earning extra $X?" Which option (A or B) will make you happier? 2. For Option (B), you need to find way to earn the extra $1,000 and can save or spend all or part of the extra money you've earned, it's up to you. 4. In measuring your happiness, please exclude the potential accumulated net-worth as one of the criteria, otherwise, Option (A) will have unwarranted advantage over Option (B). Personally, I used to be more inclined to (A) but have since moving towards (B) nowadays. My rationale: Option (A) is limited to how much (expenses) you can cut while Option (B) has limitless upside AND opportunities to create multiple income streams (passive or active) is much more promising nowadays. So, will it be Option A or B (not both) for you and why? Wah. If that's the case, I'll take option B. It's way harder though. Richard, good to see your blog on finance and stocks..did you have your stock portfolio in your blog?